DON’T fertilize: California native plants are adapted to so-called nitrogen-poor soil. DON’T amend the soil: Plant a native species that is adapted to the site’s soil. When to plant: California native plants may be planted year-round, but it is easier to plant in the fall and winter, when the weather has cooled and the rains have started. How to plant: Dig a hole slightly less deep (one-quarter inch) than the soil in the pot and twice as wide. Soak the hole several times; let the water completely drain out of the hole before planting the plant slightly higher (one-quarter inch) than the surrounding soil level; this prevents water from sitting around the crown and stem. How to water, establishment period: For a one-gallon plant, give the plant three to four gallons of water each time the top three to four inches of soil is dry; the entire root ball and nearby soil should be saturated. How often you will water depends on soil type: Plants in fast-draining soil will need to be watered more frequently than plants in slow-draining soil. Remember: Baby native plants, even drought-tolerant ones, need frequent deep watering to become established; shrubs and perennials may take a year, and trees may take more than two years. Mimic a heavy rain year for the first year, including the first two summers. After the plant is established, elongate the dry periods between the deep watering. 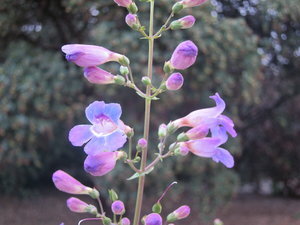 How to water, post-establishment period: In general, California native plants prefer deep and infrequent water rather than shallow and frequent. 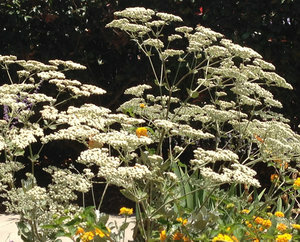 Once established, though adapted to survive on rainfall, most native plants look their best in the garden with deep infrequent supplemental water. Riparian plants will require more water while others may require NO summer water; group plants accordingly. Watering in the heat: Try to water before a heat wave hits, below 85°F, at night or in early morning. Why? Water plus heat promotes the growth of fungus, which can be bad for plants. How to mulch: The garden should have a three-to-four-inch layer of mulch everywhere except around the plant stem, crown, or trunk. No mulch should touch the plants. Mulch keeps moisture in the soil, discourages weeds, cools the roots and recycles nutrients into the soil. Irrigation methods: Overhead spray or drip irrigation may be used. With either method, make sure the system runs long enough to deliver three to four gallons of water to the roots of each plant during the establishment period. If using drip, be sure the emitters do not clog. If using spaghetti tubing, be sure to keep moving the tubing out to the drip line of the plant as the plant grows. Once plants are established (which is when they have been in the ground for two summers or have tripled in size), begin to lengthen the dry periods between deep soakings. Pruning: Should be the exception rather than the rule. In general, do not prune at bird nesting time (generally February through summer). Prune on dry, not wet, days to avoid the spread of fungal disease. To avoid stressing the plant from water loss, do not prune on hot days. California Lilac (Ceanothus species) does not the like pruning of branches larger than a pencil diameter. Deadheading: All pollinated flowers turn into something – seeds, nuts, fruit or berries that are food for wildlife! Be compassionate: Do NOT immediately deadhead old flowers; let flowers fulfill their destiny and nurture wildlife. Then, once the food has been consumed and before the next season of growth starts, cut back the flower stalks of some species to where leaves start near the end of the branch. Examples: Buckwheat (Eriogonum), Penstemon (Penstemon) and Sage (Salvia). Most California native species need no deadheading at all. Holes in leaves: Native plants are adapted to native insects; the plants have coping mechanisms for not getting eaten down to nothing. So don’t worry! Do not use insecticides. Celebrate those holes – there’s life in your garden! That life is protein for birds, lizards and other animals. To help mitigate the extinction crisis, we need to adjust our notion of beauty away from “perfect” leaves in sterile gardens to gardens that are humming and buzzing with life. Above all, take time to enjoy your new garden. Find out what works, and do more of that. It’s a process!